Welcome to Peidong Wang's page. Welcome to my website. I'm Peidong and I come from Lanzhou, China. 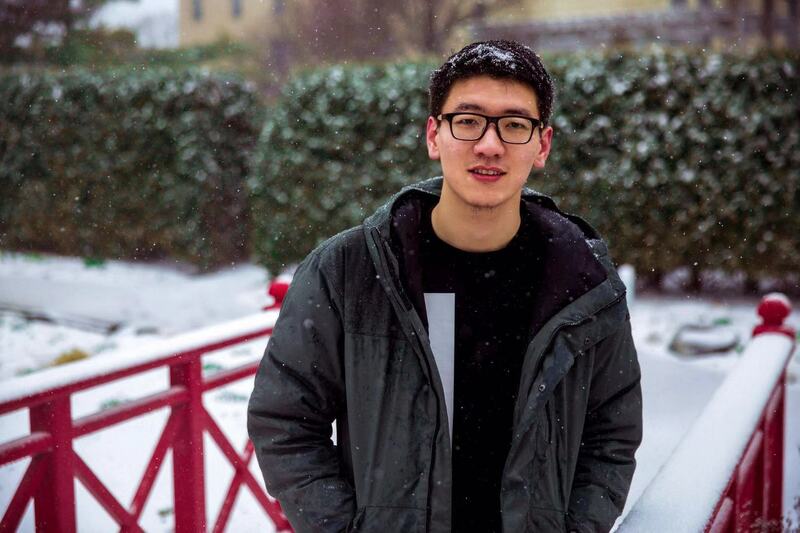 Currently, I am a senior undergraduate at University of Wisconsin-Madison double majoring in Atmospheric & Oceanic Sciences, Applied Mathematics, and with a certificate in Computer Science. Starting from Fall 2019, I will pursue a PhD degree with Dr. Susan Solomon at Massachusetts Institute of Technology to study climate science. I have a broad interest in Atmospheric and Oceanic Sciences. I started doing research with Dr. Tracey Holloway at UW-Madison combining satellite, ground measurement and model to study atmospheric chemistry since Fall 2016. 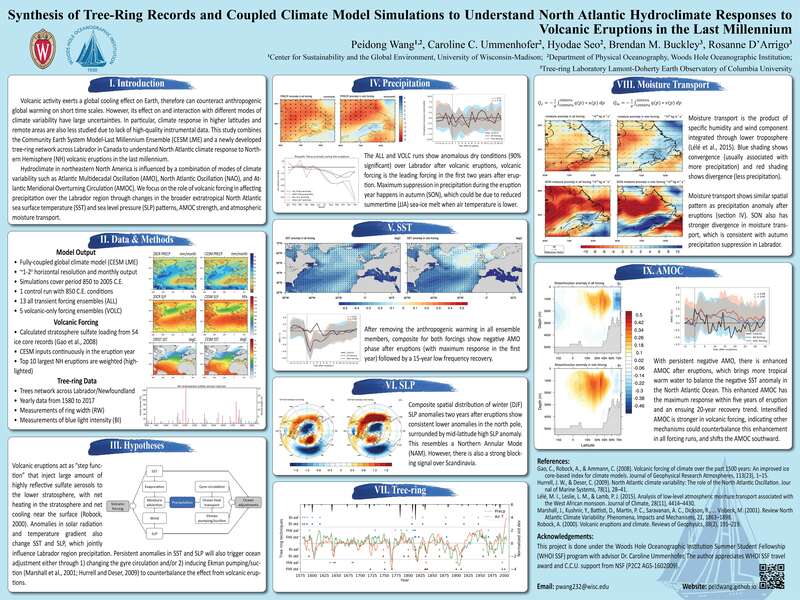 Besides, I am also doing research with Dr. Caroline Ummenhofer at the Woods Hole Oceanographic Institution (WHOI) since summer 2018 on the role of volcanic eruptions for North Atlantic regional hydroclimate from model and tree-ring records. I am a fan of traveling, nature exploring, photography, and cooking. My favorite place on Earth is Antarctica, since I like cold weather, and that is one reason I came to Madison. Background: Formaldehyde (HCHO) is considered as one of the most hazardous carcinogens in the ambient air. It is also a precursor of ground level ozone that triggers respiratory diseases. There has a limited number of ground-based monitor stations that measure HCHO on a regular basis. 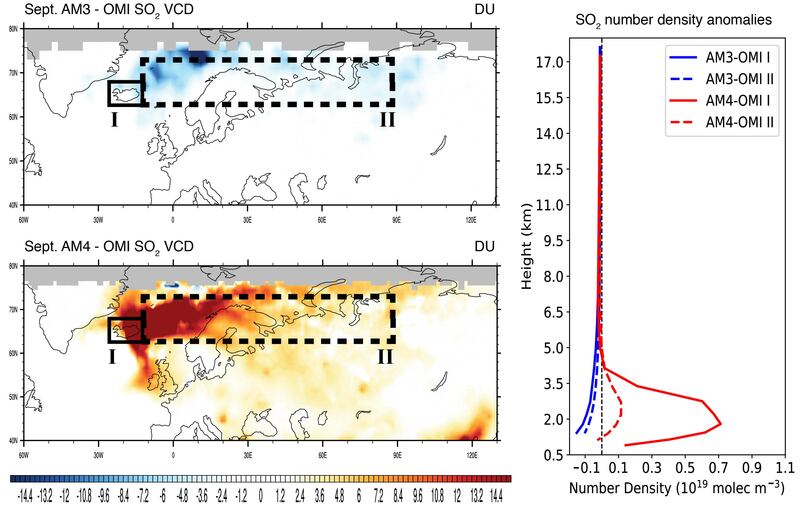 There are also several satellite instruments that observe HCHO and has been used to support the assessment of the ozone production regime combined with satellite-derived nitrogen dioxide. I am focusing on analyzing spatial-temporal patterns of ambient HCHO both from AQS (Air Quality System from EPA) ground-based monitors and OMI (Ozone Monitoring Instrument from NASA) satellite observations in the U.S. over the past 10 years. I also combine temperature and emission profiles to explain possible drivers of the HCHO patterns shown in both monitor and satellite data. Background: Volcanic activity exerts a global cooling effect on climate and thus can counteract anthropogenic global warming on short time scales. 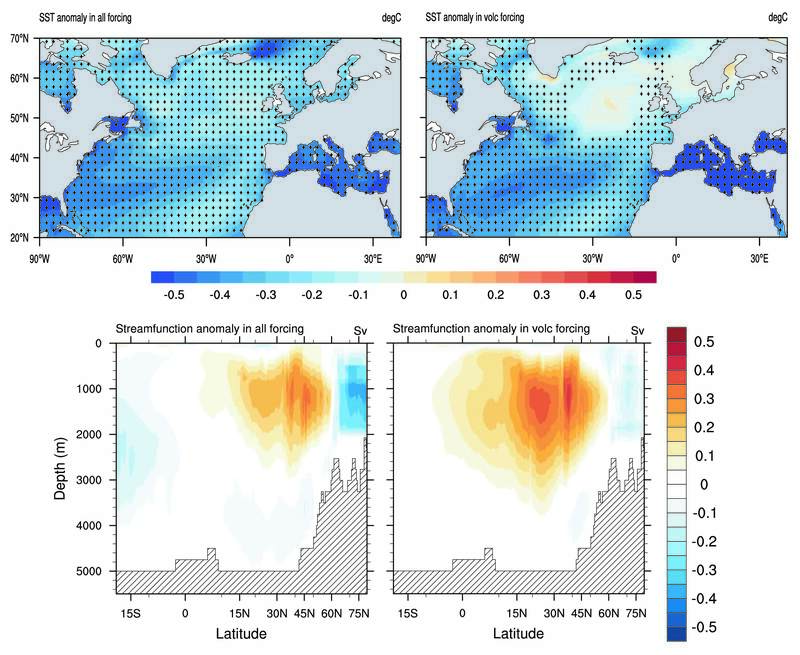 However, its effect on and interaction with modes of climate variability are not well known. In particular, climate responses in the higher latitudes and remote areas are also less studied due to lack of high-quality instrumental data. I work on combining the Community Earth System Model Last Millennium Ensemble (CESM LME) and a newly developed tree-ring network across Labrador in Canada to understand North Atlantic climate responses to volcanic eruptions in the last millennium. Particularly, I am looking at how different modes of climate variability change in response to volcanic eruptions spatially and temporally, such as changes in Atlantic Multidecadal Variability (AMV), North Atlantic Oscillation (NAO), Atlantic Meridional Overturning Circulation (AMOC), and lower tropospheric moisture transport, which as a combination change Labrador region precipitation and can be reflected in the tree-ring records. Background: The understanding toward chemistry-climate interaction is still largely uncertain, particularly due to the complicated direct and indirect effects from aerosols. The 2014-15 Holuhraun eruption in Iceland could provide more insights on how atmospheric chemistry influences climate, given the relative pure environment around Iceland. During this eruption, it emitted about 120 kilo-tonnes of sulfur dioxide (SO2) per day into the atmosphere, which could form sulfate aerosols (SO4) and further influence aerosol-cloud interaction and climate. The nudged GFDL model simulation AM3 (full chemistry) and AM4 (simple chemistry) have similar SO2 emission rate but totally different responses in SO2 and SO4 formations, leading to different climate responses. I am evaluating AM3 and AM4 with satellite observations from OMI, MODIS and CALIPSO to find what drives different responses in sulfur formation. Background: Cloud computing is an emerging technology that allows individual to have the access to shared high performance computing machines remotely. This shortens the time of processing data and makes computationally expensive works in a relatively low cost. I work on cloud computing in satellite data in atmospheric chemistry, particularly use Amazon Web Services (AWS) to perform WHIPS (Wisconsin Horizontal Interpolation Program for Satellites) to oversample level 2 satellite product to custom-gridded level 3 satellite product. More information of WHIPS could be found at WHIPS website. 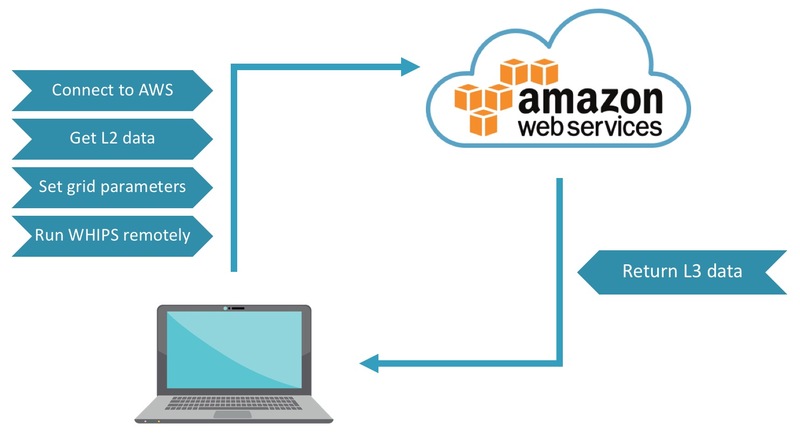 We have created a public AWS server with pre-installed WHIPS, please see the tutorial guide for running WHIPS on AWS on your own. 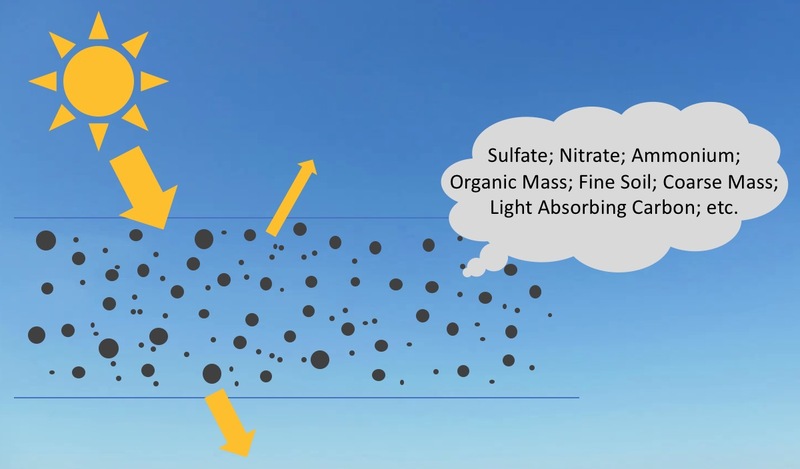 Background: Aerosols are small liquid and solid particles hanging in the ambient air, and aerosol optical depth (AOD) is a measure of the light extinction in the atmosphere by these aerosols. There are satellite instruments that detect AOD, and has been used to infer ground level air quality, especially particulate matter (PM2.5). Regional models such as CMAQ (Community Multiscale Air Quality Model) also has simulations on PM2.5. I am using an extinction model to calculate AOD from CMAQ and comparing with MODIS (Moderate Resolution Imaging Spectroradiometer) satellite observation of AOD in the U.S. in 2011.